Happy Tuesday to you all! 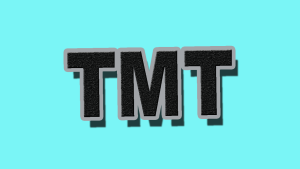 It has been more than a while since I wrote a TMT post. This past couple of months have been a whirlwind of changes. The change I am referring to is my son 🙂 He is growing so fast and learning so quickly and I actually tear up when I say this ,but he is becoming so independent. I have learned so many little mommy hacks and every day tips in the past couple of months I actually had to sit down and make a list so I wouldn’t forget. Let’s get started cause I am really excited to share! In one of my past TMT posts I wrote about how to keep your kids sleepers by simply cutting the toes off and hemming them if you don’t like the look of a rough cut. Well, I am not going to say I learned this but instead I will say I was reminded of the Queen of all money savers when it comes to kids clothing. Thrifting! I have always enjoyed thrift shopping I am only sad that I started so late in life lol. Throughout college I gave away so many items with tags on them because I either forgot I owned them or I gained too much weight to fit in them. I walked into a little piece of heaven named Kid Zone Thrift and went BANANAS! I spent a total of $20 bucks and walked out with so many pieces of clothing for my little guy and most of it was brand spanking new. 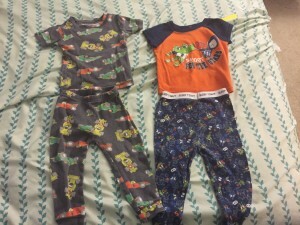 Best of all I purchased about four sets of pajamas for $1.99 a piece. Check out the picture below to see one! I even purchased a couple of t-shirts and two pair of shorts. No need to cut and sew sleepers anymore! My next TMT tip this Tuesday is all about preparation. I don’t know about anyone else, but I actually can not stand carrying about those big bulky baby bags. I have even tried just purchasing a canvas bag, you know like the ones from your college days. Yeah, I quickly remembered why I hated those too. They get too heavy and I end up with a bruised shoulder or back pains. What makes it worse is I somehow seem to forget the perfectly packed baby bag that took about 30 minutes of my life to pack and then I end up stuck with a diaper full of poop explosion, an upset baby and a headache lol. So, I wised up and decided to create and emergency baby stash in my car. Yup. I mean I have everything in a bag in my trunk. I’m talking diapers, wipes, nasal aspirator, a second outfit, an empty sippy cup, sunblock, baby lotion…. Let’s just say I am stock piled just incase. Simple hack for any mom out there who hasn’t already thought it up. My last TMT tip is actually something my wonderful husby taught me. Yes Ladies, our husbands can teach of a thing or two about parenting 🙂 My husband, son and I were recently at a birthday party for a cousin of mine. It was outside at a park and yes it was pretty warm out. My son was very thirsty and unfortunately the sippy cup we had on hand had leftover milk in it and we would rather wash it out with soap and water before letting him drink that so, Steven, my husband took my water bottle pulled out a knife from his key chain (yes my husband walks around with a utility key chain) I joke on him all the time up until he used that knife to poke a hole in the cap of the water bottle. This way baby pie can tilt the bottle up like he would his sippy cup and drink until his little tummy is content. I am going to be honest y’all, husby never looked sexier 🙂 Now when we are out and the opportunity presents it’s self I never hesitate to hydrate my son by any means necessary. Some may think it’s a bit much, but given the situation and my sons temperament when hungry or thirsty, I was one satisfied mama. Well that’s about it for my TMT tips, I realize this is all baby related but lets me honest my life revolves around my number one guy Ty these days. I hope you all enjoyed this blog post and most of all I hope you enjoy the rest of your week! Stay Inspired folks! My thoughts exactly! Happy Saturday! If you work hard enough. Please click below to be taken to my new home. You can follow me on my new website. Hope you all are having wonderful day! Ty just kind of chilled out. He looks at me now like why are pulling the camera all the time now lol. I have become obsessed with documenting him for family. Every moment is special. New site www.nettafied.com! come over and follow me! My mom is always telling me how she wants to see Ty everyday and my husbands parents and extended family that live out of country love seeing him as much as possible. So, we decided to start documenting Ty’s everyday activities. Well, not everyday, but every Thursday through Saturday as of now. This way the family that is not able to physically be here with him as much as we would like can get a little piece of him. Below is our first vlog. Please be patient with me guys, I’ve never done this before so I’m definitely a bit awkward lol. Hope you all enjoy! It is 6:53am on Thursday morning and it is now 54 degrees, when yesterday was 72. Too much of this kind of weather can drive anyone crazy. I love cold weather because it gives me the okay to throw some thick leggings on with boots under a pea coat and scarf and still look somewhat fashionable. I just wish our cold weather were more consistent. This week I am thankful for the warm weather we have had lately. The weather in NC is far from normal. It can go from 40 degrees one day to 72 the next. This week we actually had two beautiful, sunny days! Yes, I am very excited about that lol. I am over winter at the moment and can not wait for the first day of spring. I have it marked on my calendar, although around these parts it doesn’t exactly mean that the weather will be warm, still I am hoping for the best. Gardening, I am obsessed with trying to not only master planting, but growing my own vegetables. So there will be a lot of YouTube watching in the near future. My usual park runs! I love my treadmill, but I really don’t use it the way I should. The reason, I need fresh air! My treadmill is crammed in a corner of a guest bedroom with the view of a wall. It only does the job for so long. The park in the spring is great, it’s not too hot, the air is crisp in the morning and it provides me with scenery that isn’t a wall. There are two seasons I love the most and that is fall and spring. You get the best weather in both. Not too hot or cold, the leaves changing colors in the fall are beautiful, the sun shining just right in the spring is the perfect warmth. Yup I am reminiscing. It is definitely time for spring. Last but not least, my baby pie’s birthday! On May 4 my son will be 1 years old. It is so hard to believe my little 7 pound baby will be turning one in two months. He is growing so fast, I was warned to be ready for the day I turned around and he is a toddler. My heart sank just a little yesterday as I was leaving a store and the sales clerk asked how old Ty is. I accidentally said 9 months and had to correct myself. “10 months, he is 10 months today.” My little baby pie is growing up and somehow I wish I could slow him down just a little. What are you all thankful for this Thursday? Leave it below if you would like to share. Have a happy Thursday and Stay Inspired! I have used the banding method lately to stretch and dry my hair. I love it! My curls are smoother (provided I do not separate too much and cause frizz), the length of my hair is longer and I found that my halo braid is so much easier to put in after using the banding method. I was even able to wear different styles longer Tuesday through Saturday. See below! If you are currently following me on this blog, please go and subscribe to my new blog home here. Thanks for your support! I re twisted Monday night and the curls came out what I like to call “wild child” but I liked it, so I rocked it. Yes, the curly puff is back by hump day but I added a little something new in the front by letting my bang out. My hair still had lots of volume and length. I went fro tastic! and I felt my absolute sexiest! By Thursday the length was still present from the banding method, all I did was comb out my hair and well my fro! My hair felt soft and thick! I decided to go with my braided halo for the weekend. Because my hair was stretched previously, this made the halo braid easier to attempt. Sunday is wash day for me so the halo braid made de-tangling super easy. Now check out the video below to see the banding method I used on my hair. I hope you guys enjoy your week! Stay Inspired!